Babcock International is a very large organisation. We do everything – from acquisition, marine and defence to airports and infrastructure. My business is the rail industry. We work throughout the whole of the UK and with quite a few UK universities, largely based on the different locations we operate out of. I have attended a few meetings at Glasgow Caledonian University’s (GCU) careers department and found them to be really, really helpful, to the extent that last year I extended an invitation to them to participate in my graduate assessment centre so they could take back the experience to GCU. I have high regard for the lecturers, they are very proactive. For example, at the moment we are dealing very closely with a lecturer in the electrical department, working together to encourage more applications from good graduates. 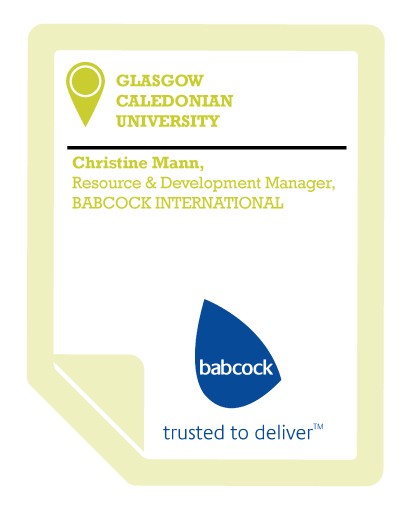 The calibre of CVs I get from Glasgow Caledonian University I think is second to none – they’re trained in the area we want, they have the calibre we are looking for and I rate them highly. We are thinking about how we engage more actively with universities to continue the relationships we have and to build on them. For example, I’m contacting universities to give them a profile about us and what we do and to become more involved with career events. I want to have a whole series of events programmed with universities which perhaps will attract graduates to Babcock – in aerospace, rail, and encouraging more women into engineering. It’s a lot of work but I think that it’s worth it if it pays off and we can attract graduates into our business. Glasgow Caledonian University is very proactive, the University is in tune with our business needs. Last year I needed an extra 10 graduates from GCU in the electrical field. I phoned the careers department and in the space of two weeks they had presented me with eight CVs for my students. They were all excellent. For me, it’s all about the relationship between us and the University and that’s why I want to forge links more broadly with other universities. We’re starting to talk to them at a high level and they’re starting to put us in touch with people throughout the University. I would definitely say approach Glasgow Caledonian University, they are very approachable. If they can help you they will. They’re a very realistic down to earth university. I can’t praise them highly enough, definitely give them an opportunity to work with you closely.